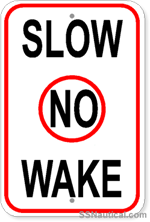 This sign is 18 inches wide x 24 inches tall. 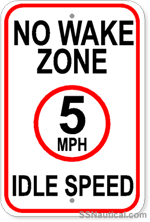 Made from .080 inch thick aluminum, this No Wake sign will not rust. For municipal and private use. This sign is 18 inches wide x 24 inches tall. 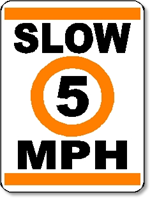 Made from .080 inch thick aluminum, this Slow 5 MPH sign will not rust. For municipal and private use. 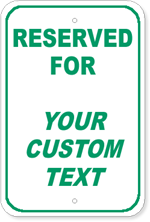 This sign is 18 inches wide x 24 inches tall. 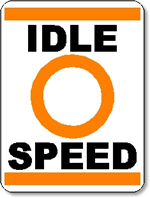 Made from .080 inch thick aluminum, this Idle Speed sign will not rust. For municipal and private use. 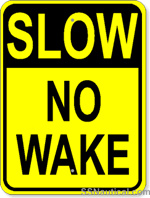 This sign is 18 inches wide x 24 inches tall. 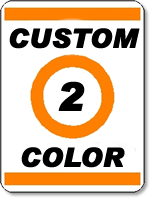 Made from .080 inch thick aluminum, this Custom sign will not rust Add in your own custom wording. For municipal and private use. 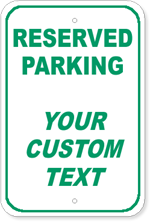 Custom Sign - Legend: RESERVED PARKING + Your Custom Wording, Sign Size: 12 inches wide x 18 inches high, Color: Green copy on White field, Corners: 1 1/2 inch radius, Holes: Two 3/8 inch holes top and bottom centered, inset 1 1/2 inches. 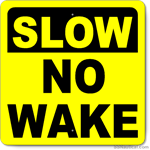 Legend: SLOW NO WAKE, Sign Size: 30 inches wide x 30 inches high, Color: Black copy on Yellow field, Corners: 1 1/2 inch radius, Holes: Two 3/8 inch holes top and bottom centered, inset 1 1/2 inches. 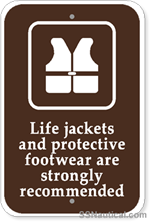 Perfect at marinas or waterways. 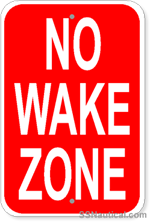 No Wake Sign 24'' x 24'' - Reflective Aluminum Type 1 Engineer Grade Prismatic Reflective Sheeting on .080 Aluminum. Material will reflect at night when light hits it. 24 inches x 24 inches Diamond. Color: Black copy on Yellow field. 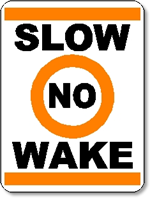 Legend: NO WAKE. 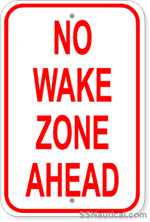 No Wake Sign 30'' x 30'' - Reflective Aluminum Type 1 Engineer Grade Prismatic Reflective Sheeting on .080 Aluminum. Material will reflect at night when light hits it. 30 inches x 30 inches Diamond. Color: Black copy on Yellow field. 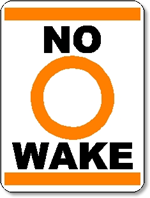 Legend: NO WAKE. 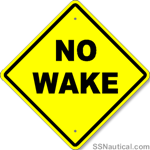 Legend: SLOW NO WAKE , Sign Size: 18 inches wide x 24 inches high, Color: Black copy on Yellow field, Corners: 1 1/2 inch radius, Holes: Two 3/8 inch holes top and bottom centered, inset 3 inches. 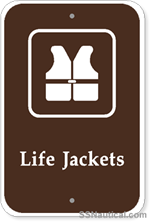 Perfect at marinas or waterways. 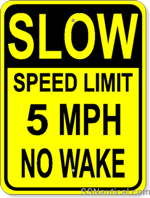 Legend: SLOW SPEED LIMIT 5 MPH NO WAKE , Sign Size: 18 inches wide x 24 inches high, Color: Black copy on Yellow field, Corners: 1 1/2 inch radius, Holes: Two 3/8 inch holes top and bottom centered, inset 3 inches. Perfect at marinas or waterways. 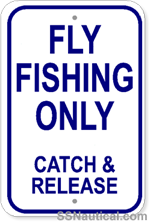 Legend: MARINA with Left Arrow, Sign Size: 12 inches wide x 6 inches high, Color: Dark Blue copy on White field, Corners: 1 1/2 inch radius, Holes: Two 3/8 inch holes top and bottom centered, inset 1 1/2 inches. Perfect at marinas. Legend: MARINA with Right Arrow, Sign Size: 12 inches wide x 6 inches high, Color: Dark Blue copy on White field, Corners: 1 1/2 inch radius, Holes: Two 3/8 inch holes top and bottom centered, inset 1 1/2 inches. Perfect at marinas. Legend: MARINA with Up Arrow, Sign Size: 12 inches wide x 6 inches high, Color: Dark Blue copy on White field, Corners: 1 1/2 inch radius, Holes: Two 3/8 inch holes top and bottom centered, inset 1 1/2 inches. Perfect at marinas. 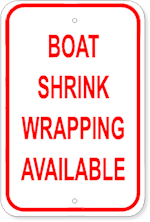 Legend: BOAT SHRINK WRAPPING AVAILABLE, Sign Size: 12 inches wide x 18 inches high, Color: Red copy on White field, Corners: 1 1/2 inch radius, Holes: Two 3/8 inch holes top and bottom centered, inset 1 1/2 inches. Perfect at marinas. 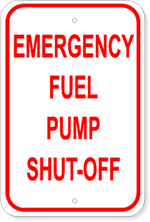 Legend: EMERGENCY FUEL PUMP SHUT-OFF, Sign Size: 12 inches wide x 18 inches high, Color: Red copy on White field, Corners: 1 1/2 inch radius, Holes: Two 3/8 inch holes top and bottom centered, inset 1 1/2 inches. 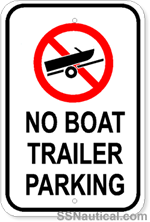 For use at marinas with fuel stations. 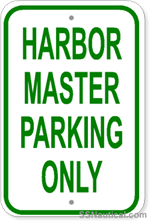 Legend: HARBOR MASTER PARKING ONLY, Sign Size: 12 inches wide x 18 inches high, Color: Green copy on White field, Corners: 1 1/2 inch radius, Holes: Two 3/8 inch holes top and bottom centered, inset 1 1/2 inches. Perfect at marinas. 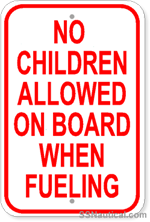 Legend: NO CHILDREN ALLOWED ON BOARD WHEN FUELING, Sign Size: 12 inches wide x 18 inches high, Color: Red copy on White field, Corners: 1 1/2 inch radius, Holes: Two 3/8 inch holes top and bottom centered, inset 1 1/2 inches. Perfect at marinas.